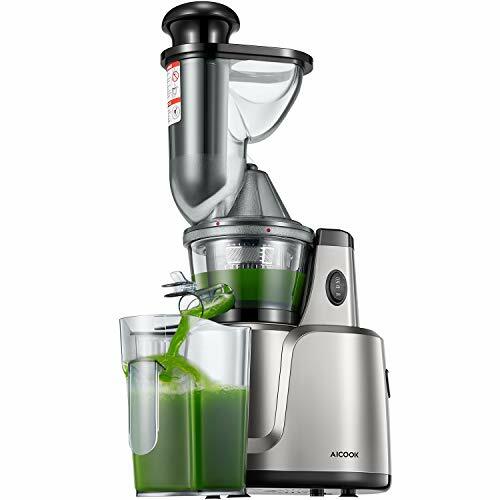 Aicook Slow Masticating Juicer!! Sweet Deal!! Priced at only $135.99 was $249.99. Ships Free with Amazon Prime! 🍹MULTIFUNCTIONAL & ACCESSORIES – The juice made through the precise filter is more delicate and slag-free, and the coarse filter can leave some pulp. Special accessories without holes for making ice cream, 3 In 1 design satisfy various taste demands. 🍹HIGH NUTRITION & JUICE YIELD – Masticating juicer rotates at a low speed of 60 RPM, producing less heat and reducing oxidation, maximally retaining nutrients from fruits and vegetables, up to 90% juice yield. 🍹3” WIDE FEED CHUTE & ANTI-DRIP DESIGN – 3” Wide Feed Chute Design for the whole fruits and Vegs, without chopping. With anti-drip design, juice release is controllable and won’t let the juice drip on the Table. 🍹EXTREMELY QUIET & EASE TO CLEAN – Less than the 60 dB low noise level, non-slip feet ensure lower vibration. Pre-clean and reverse function make it can be easily cleaned and prevent the machine from getting stuck. 🍹SAFETY & WARRANTY SERVICES – The safety lock ensures that you can only start the machine if the machine is properly installed. We provide 3 years warranty and lifelong technical consultation and customer service, ready to serve you within 24h.